On April 2, 1792, The United States Mint was officially established, and with it came authorization for the first U.S. Silver Dollar. That silver dollar, the 1794 Flowing Hair Silver Dollar, is the most important dollar coin ever struck – and one of the rarest U.S. coins in existence! Now, for the first time ever and in honor of the 225th anniversary of America’s First Silver Dollar, the Smithsonian® has authorized the release of proofs bearing the same design as the original. Bearing an obverse design inspired by Benjamin Franklin’s 1781 Libertas Americana Medal and a stunning eagle reverse, the Flowing Hair Silver Dollar first existed as a single copper pattern struck to test the dies. Currently housed in the Smithsonian’s National Numismatic Collection, it’s a priceless artifact many numismatic experts believe could fetch upwards of $20 million at auction. Even if you could afford such a sum, don’t get your hopes up; curators at the Smithsonian said in no uncertain terms that the coin will NEVER be put up for sale! But now you can get the next best thing with this spectacular three-piece proof set! This set includes three proofs: a half-ounce 99.9% gold proof, a one-ounce 99.9% silver proof and a one-ounce copper proof. Each bears the iconic design of the original 1794 Flowing Hair Silver Dollar – a design listed by author and expert numismatist Jeff Garret in his book 100 Greatest U.S. Coins. 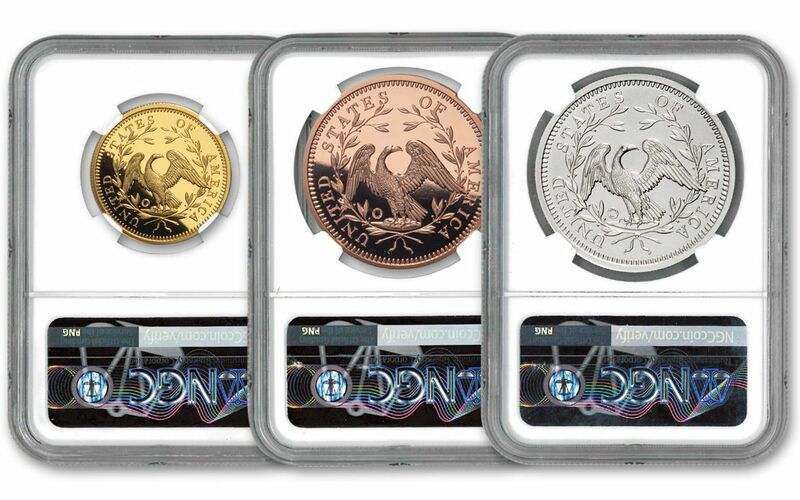 In addition, each proof has been certified and graded by the Numismatic Guaranty Corporation (NGC) as being in flawless Proof-70 Ultra Cameo (PF70UC) condition, a distinction that means your perfectly-graded proofs will have ZERO imperfections – showing all features and fields exactly as the engraver and mint intended! Plus, they will come sonically sealed in acrylic coin capsules with labels bearing the Smithsonian’s distinctive sunburst logo. Only 500 of these Smithsonian-authorized America’s First Silver Dollar Half-Ounce Gold/Silver/Copper Three-Piece Sets will ever be released and they available only through GovMint.com and its marketing partners. Don’t miss this opportunity to hold history in your hands – secure one of these sets to your cart today! PROOF SET HONORS AMERICA’S FIRST SILVER DOLLAR – These gold, silver and copper proofs were struck to commemorate the 225th anniversary of America’s First Silver Dollar, the 1794 Flowing Hair Silver Dollar. Each features an obverse design inspired by Benjamin Franklin’s 1781 Libertas Americana Medal and a stunning eagle on the reverse. OFFICIALLY AUTHORIZED BY THE SMITHSONIAN – The Smithsonian® has officially authorized the release of these proofs. Each will come sonically sealed in acrylic coin capsules with labels bearing the Smithsonian’s distinctive sunburst logo. STRUCK IN GOLD, SILVER AND COPPER – These America’s First Silver Dollar Proofs are struck in a half ounce of 99.9% gold, one ounce of 99.9% silver and one ounce of copper. 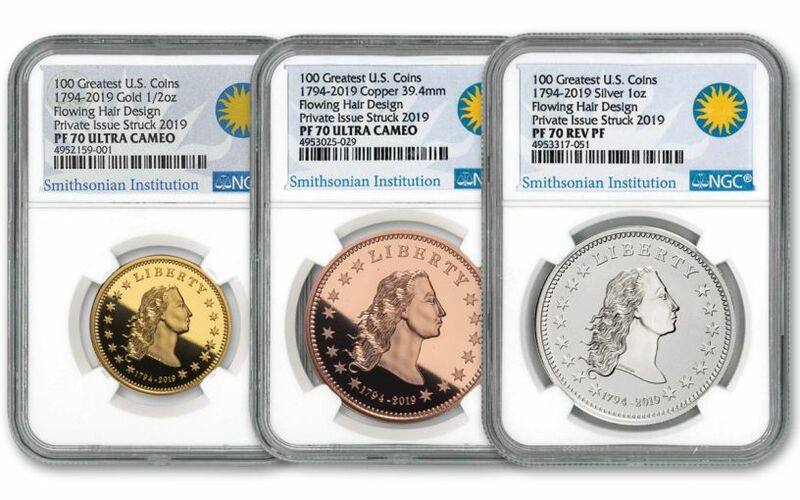 GRADED IN PERFECT PROOF CONDITION – Your America’s First Silver Dollar One-Ounce Gold/Silver/Copper Three-Piece Set has been graded by the Numismatic Guaranty Corporation (NGC) as being in flawless Proof-70 Ultra Cameo (PF70UC) condition. EXTREMELY LOW LIMITED EDITION – Only 500 of these special sets have been struck for worldwide release. Commemorate the 225th anniversary of the Flowing Hair Silver Dollar with the America’s First Silver Dollar Half-Ounce Gold/Silver/Copper Three-Piece Set. Order yours now!